An exhibition of prints and silkscreen monotypes A memory diary of places visited. I am having a solo show featuring over 60 paintings and monotypes, at For Arts Sake Ealing. I am delighted to be the first local artist to have been asked to exhibit in the gallery. My recent work is a series of memories, an expressive response to places seen and visited. Over time I have moved away from producing representational work to being more interested in mood and memory. For the exhibition, I gave an interview to Alexa at For Arts Sake. She has written a fantastic piece which you can read here. I look forward to being in the gallery on the afternoon of the 19th January from 1-5pm. If you’re in West London, why not join me for a glass of wine and I can show you the work. Jill, Andy and I had a great couple of weekends welcoming the public to view our work at this year’s open studio as part of Ealing BEAT. Andy Lomas’s computational 3d sculptural forms, moving images and prints blew not only me, but the whole of Ealing away. They look as if they’ve emerged from the ocean - but an ocean from a parallel world. jill’s beautiful landscape paintings and prints were much appreciated and I had a chance to display some new large canvases along with smaller works and silk screen monotypes. We met a large number of very interesting and interested people and would like to thank all that came. Iona Stern’s large abstract oil paintings and screen printed monotypes. Andy Lomas’s 3D sculptures. Thank you Gina Pierce design for the photograph showing screen print monotypes. My love of screen printing started young. My earliest screen print was done when I was studying for my A levels at DLA (Drama and Liberal Arts) Stratford-upon-Avon college. Having recently left my very strict girls’ school in Warwick, the new freedom the course offered was a like a breath of fresh air. DLA was a hotspot of theatrical talent and many well known actors, writers and directors started their careers under the tutelage of the head, Gordon Vallins. It was an amazing time but I never lost sight of wanting a career in art. For much of my life I worked as a creative art director/designer, and came back to painting just six years ago. What is exciting is that I have recently rediscovered my love of silkscreen but this time around have found a way to combine painting and printing by painting directly on the back of the screen and then pulling through. It has opened up a whole new world and I feel as if I’m back as a child making pools of fabulous colour which I combine in a free and expressive way. A couple of examples of my hand painted silkscreen monotypes. NEW DAY. Hand painted monotype. Coastal scene. Another coastal scene. ‘Across the pebbles’. Hand painted monotype. I’m delighted to have been selected to exhibit at The Other Art Fair. My next art exhibition is in the heart of London. 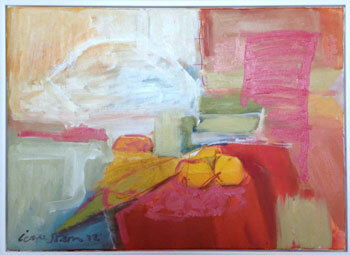 I am showing recent paintings which follow my a journey from abstracted realism into abstraction. Colour and expression are the most important elements in my work. The paintings are framed and affordable. Away from the coast, Southern Spain is a land of mountains and white towns. The light is dramatic and harsh. Nearly every year we go to Ronda, in the mountains of Andalucía, to see my good friend Jane. We have been friends since we were eight years old at a prep school called Arden Hurst in Henley-in-Arden, Warwickshire. Jane and her husband Pete moved to Ronda over twenty years ago to set up and their holiday villa business. With their clear vision and work ethic, their company Real Ronda is now the foremost holiday villa company in southern Spain. I was so delighted that they chose to use one of my Ronda paintings on their website. This year we could only make a flying visit, but despite this I managed a full day painting. Their house is in an amazing position with views down the valley looking towards Seville. The whitewashed walls of the villa framed by dramatic umbrella pines, which hover like menacing clouds overhead. When I paint outside from life, I work incredibly fast. Sometimes it works out and sometimes not. 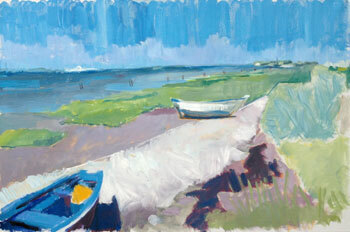 I find that when painting in the field, probably not unsurprisingly, my brushstrokes have more energy. One of my biggest failings is to fiddle with the paintings once I get home and the result can end up looking overworked. This time I have decided to use the two paintings as starting points for future works. This follows a discussion I had when painting with a fellow artist Lucy Powell. Lucy has trained with the highly respected teacher, Robin Child and kindly shared some of his wisdom with me. Where I want to get to is to paint a feeling rather than just a place. So in this blog I am showing my starting point with my two recent paintings painted at the home of my friend Jane in Ronda. Maybe you’ll be interested in seeing my ‘feeling paintings’? Watch this space to see the development from my works while painting in Southern Spain.